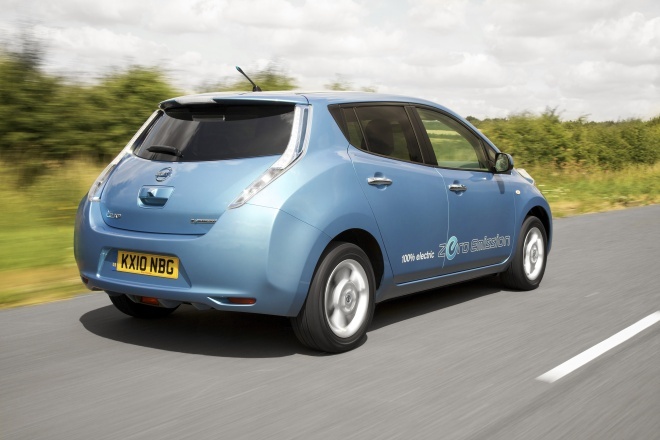 I was recently invited to give a lecture for BusinessGreen on the economics of running an electric vehicle as a company car. I thought I knew all about electric cars and the incentives to encourage their adoption, but as my research quickly revealed I didn’t know the half of it. I didn’t know the complicated, confusing half. So here is a summary of the facts, as simply and as clearly as I can explain them. Let’s start with the Plug-in Car Grant, which is probably the best known and most widely discussed EV incentive. Administered by Olev, the Office for Low Emission Vehicles, it contributes up to 25% of the purchase price of an electric car, capped at £5,000 per vehicle. It applies to battery EVs and plug-in hybrids alike. As a buyer of an EV, you won’t ever see the five grand yourself: it’s deducted at source. Indeed, it is the manufacturer who has to apply to take part in the scheme. Ten models of car are currently included in the scheme – not all are currently for sale – and one notable manufacturer has declined to take part. For reasons that it hasn’t yet revealed, Tesla has not submitted an application to Olev. Perhaps taxpayers subsidising its pricey playthings has a mite too much negative PR potential for Tesla’s liking. Having understood the Plug-in Car Grant, you might as well forget it. Manufacturers have priced their cars in the knowledge that the grant is there, and have set their tariffs pretty much as high as the market will stand. In effect, the government is using the grant to subsidise manufacturers. I don’t think it’s a coincidence that the newly installed coalition government confirmed the grant well ahead of its comprehensive spending review, at a time when Nissan was pondering whether to build electric cars and batteries in the UK or in Portugal. The grant went ahead and, coincidentally, Nissan will be building Leafs and Leaf battery packs on Tyneside come 2013. Next there are a bunch of incentives designed to encourage low-CO2 transport, which apply to electric cars as well as to suitably efficient conventional cars. Choose a car that emits less than 100g/km and you don’t have to pay the London Congestion Charge. Once in possession of your eco car, you can apply for the greener vehicle discount via the Transport for London website. Choose a car that emits less than 100g/km and you can duck both showroom tax and road tax. Choose a car that emits 110g/km or less and you can enjoy 100% Capital Allowances in the first year. And that last point probably needs some explaining. Capital Allowances are tax breaks for companies, designed to encourage investment in particular kinds of equipment. Spend on a qualifying asset and you’re allowed to deduct a defined percentage of the cost from your profits when it comes to calculating corporation tax. You will thus face a lower tax bill, which is in effect a discount on the price of the asset. If your firm is small and has profits below £300,000, it pays 20% corporation tax. If you choose an electric car, it can immediately deduct 100% of the cost from its profits, thus avoiding 20% of the price of the car in tax, effectively reducing the EV’s sticker price by 20%. If your firm is large and has profits above £1.5 million, it pays 26% corporation tax. If you choose an electric car, it can immediately deduct 100% of the cost from its profits, thus avoiding 26% of the price of the car in tax, effectively reducing the EV’s sticker price by 26%. The bigger firm, which can better afford to buy things, thus gets a bigger bonus from going electric. Which hardly seems fair but then we are talking about tax. Fair rarely comes into it. Finally, if your firm is in the middle, with profits above £300,000 but below £1.5m, it pays a transitional rate of tax on a sliding scale between 20% and 26%, depending on the exact level of profit. Here’s where it gets interesting because Capital Allowances have a double effect. By cutting the level of profit, the allowance reduces not just the tax bill but the tax rate as well. If you choose an electric car, your firm can immediately deduct 100% of the cost from its profits, and when you plug in the values into a suitably primed spreadsheet you’ll find that the firm avoids 27.5% of the cost of the vehicle in tax, thus equivalent to a 27.5% discount. So again, it’s hardly fair, but mid-sized firms find themselves in a sweet spot. The tax man will help them buy EVs as company cars with a particularly generous contribution. Ordinary cars attract their own Capital Allowances, according to their CO2 rate, but typically offer less benefit staged over a longer period. And as I mentioned earlier, cars with a 110g/km CO2 rating or lower get the same breaks as EVs. Actually, the situation is even more complex than the above would suggest. When calculating the tax saving, the company has to factor in the percentage of business use. If a car travels 80% business miles and 20% domestic trips, the firm can claim only 80% of the discount, for example. Oh, and the enhanced Capital Allowance dispensation for low-CO2 cars ends on 31 March 2013. So if you want it, get a move on. Moving on from the low-CO2 incentives, let’s look at incentives that are specific to zero-emissions cars. The big one is Benefit-in-Kind tax – a levy applied against all company cars, taxing the perk of being handed the keys to a new car every few years (even if slogging up and down the M1 in a Ford Mondeo doesn’t sound like much of a perk). BIK is paid by the user-chooser, with the tax man reaching into your pay packet and deducting real cash from earnings. The actual amount of BIK paid depends on the cost of the car, its CO2 rate, and its type of fuel. The rate tops out at 35% for the most polluting cars, and can go as low as 5% for a very-low-CO2 petrol car like the upcoming Chevrolet Volt. You take the purchase price of the car, multiply by the applicable percentage, and then pay tax on the resulting value at your top PAYE rate, every year. Choose something pricey and polluting, and you’ll face a rather nasty tax bill. But choose battery power and you’ll pay nothing at all, because the applicable BIK rate for EVs is currently a lovely fat zero. Again, this substantial saving is available for a limited time only. From the 2015/16 tax year, the applicable rate for electric cars will rise to 9%. Next up, Class 1A National Insurance Contribution. This is effectively the slightly less ugly sister of BIK, being paid by the employer rather than employee and running at a lower rate. Where PAYE rates go up to 50% for those earning the wealthy side of £150k, 1A NICs are currently fixed at 13.8%. Again, you take the price of the car, multiply by the CO2-related rate, and pay at 13.8% on that value. And again, until April 2015, the applicable rate for electric cars is an attractively round nought percent. Add it all up and the results make EVs surprisingly attractive. Let’s look at how the numbers fall out for a real electric car – the Nissan Leaf. And to make things tough, let’s see if it can beat a miserly, low-CO2 conventional car – the 99g/km Volkswagen Golf BlueMotion. I’ll assume 50% private use (which makes no odds to which wins) and I’ll put aside insurance costs (which will be broadly similar, according to Aleksander the Meerkat) and ignore the rising cost of diesel. The VW will retain 45% residual value after three years, according to WhatCar.com. The Nissan will retain 42% according to the same source (which I suspect is a pessimistic guess). 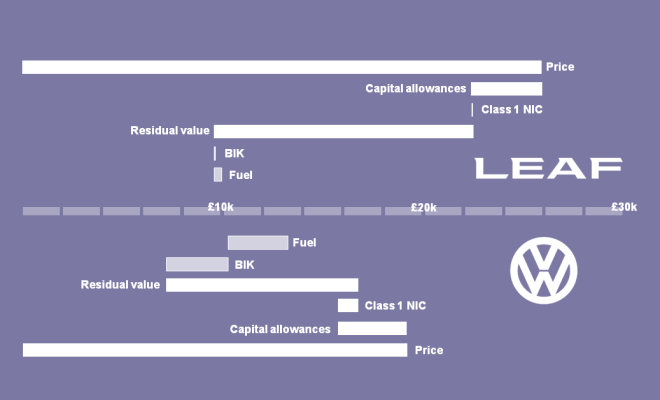 The Leaf costs £25,990, the VW costs £19,250. Sell them both after three years and 30,000 miles, and the VW will have cost between £14,400 and £16,100 to run, depending on PAYE rate and company size. The Leaf? Between £11,900 and £12,900. Do more miles? The VW comes off worse. Add in rising energy costs? The VW comes off worse. Consider the filthy business of filling up with diesel? It ain’t the VW that smells of roses. Almost any way you cut it, the worst case scenario for the Leaf winds up cheaper than the best case for the VW. The Leaf ties up more capital, but earns its keep through zero BIK, zero NICs and cheaper fill-ups. And if constrained supply props up that 42% residual to nearer 50%, the balance tips even further in the Leaf’s favour. So good are EVs at avoiding tax, that there’s a real untapped potential here. While an ordinary company car may make a dubious perk, accepting an EV is substantially better than being given additional cash. Real money is taxed at 20%, 40% or 50%. An EV is taxed at, well, zero. So is it a good idea to run an EV as a company car? As long as you understand the limitations and benefits of electric cars, and are happy with that side of the ownership equation, the financial case is a no-brainer. Going electric is very clearly the best business bet.